yesterday we had a birthday. snowboarding was the order of the day. followed by films, pizza, giggling and sweets. my boy had had a difficult day. I had probably entered into the realms of parent never to be forgiven. Ah Heather, isn't Motherhood such an up and down game - and don't we beat ourselves up endlessly whenever things go off course a bit! Tomorrow is another day and both you and your boy will recover from the hurts of today - sleeping on 'things' mostly seems to help. I understand where you're coming from - and the most difficult part is to forgive oneself - but none of us is perfect. I agree with Jane ... You'll remember the argument and feel guilty long after he will, I'm sure you said youwere sorry, so just let it go. You made his birthday special, and that's what he'll remember. It all looks very lovely, you've gne to lots of trouble and just wanted a perfect day ... 15 is a difficult age at thebest of times, so don't beat yourself up over it. The sun is shining here,it's an amazing late summer day, hope it's shining on you too, sweetie! Your Gorgeous Sunflowers look wonderful in your lovely home. Sorry things got a bit stressful for you yesterday. My twins will be 15 in a couple of years....can't say I'm looking forward to it! I really think you did your best to make his day special!!!! teenagers are difficult to handle sometimes and when I read your posts I think about my teen, too! He is just 6 months younger than your boy.....so we share the same ""problem""!! He will forgive you sooner than you'll do with yourself. Hi Heather,I think all will be forgotten as the day seemed to have turned out just fine!! !Such is life!! 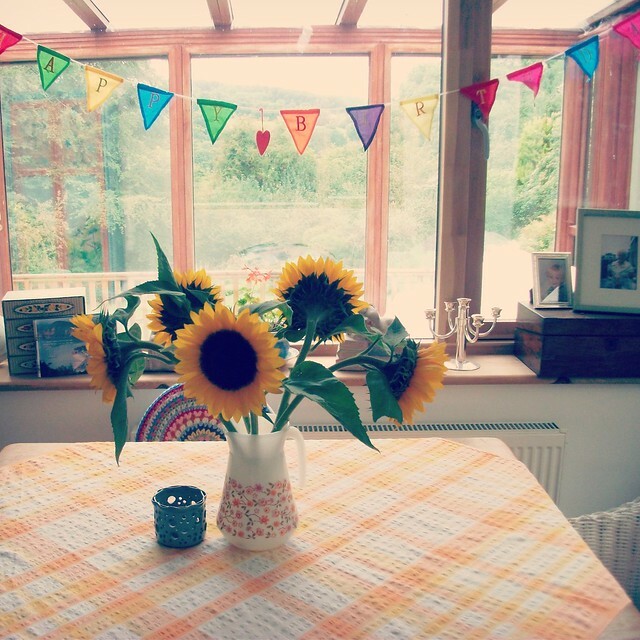 !Love your birthday room with its cheery buntings and sunflowers!! !Have a great weekend and best wishes ti the birthday boy!!! Heather I always feel so horrible after I argue with my teenager, he just says the most sarcastic stuff and we end up in the worst fights. But you know I keep telling myself that he's going through puberty and this will pass. I know you love your son so much, and as long as he knows that too, that's what matters. You are not alone, Heather! You love your son and, thank goodness for him, you are not perfect. I think a perfect parent must be a very hard role model to live up to. I always feel rotten after a family argument but sometimes, just sometimes, they clear the air and help us move forward with good intentions. Oh my word - fifteen! I am eighteen months away from that. Boys...teenagers - one minute they are loving and irresistible fabulous company the next, picking an argument. It's tough growing up...and being a parent. I'm sure (hope) it doesn't last for ever.